Not that many years ago, a veterinarian dealing with that situation would have a limited arsenal of tools to guide the diagnosis, sometimes involving considerable trial and error. Today, however, McKee is able to take advantage of advanced diagnostic imaging techniques. After an MRI (magnetic resonance imaging) was done on this horse’s hooves, McKee found a serious ligament tear at the bottom of the cannon bone – not an infection at all, but a very different situation that required a very different treatment. “The disparity between what veterinarians examining the outside of the horse suspect and the reality revealed by advanced diagnostic imaging can sometimes be dramatic. Without these more advanced forms of imaging, you only know a little bit about what is going on. With an MRI you can see the ligaments and bursa and all the structures, as well as details like bruising of bones that won’t show up on an x-ray. It has really changed the process of diagnosing and treating lameness,” says McKee. The horse is brought to the clinic and has his shoes removed. An x-ray may be done to ensure there are no nail fragments in the hoof, because any metal can affect the imaging. Pownall recalls a case where they were unable to get a clear image because the horse’s owner, who was holding the lead rope, had some embedded metal in his leg. The owner left the room and the MRI proceeded without further problems. With a sedative drip in place, the horse is walked into position and stands, dozing, for about 60 to 90 minutes while the scans are done. Usually, if lameness is present in one foot, both will be scanned so that the “good” foot acts as a control. 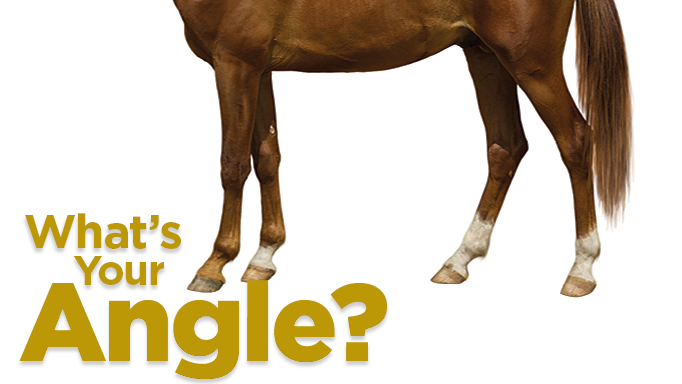 McKee explains that sometimes a horse may have a structure that looks abnormal, but if it is present in both feet it can just be a variation in anatomy. Within two or three hours after arrival at the clinic, the horse is ready to be loaded up and trailered home. The cost of an MRI scan varies, but is generally between $1,200 and $3,000. It is important, McKee adds, that before advanced diagnostic imaging is done, previous examinations should have narrowed the source of the problem down to a specific area. 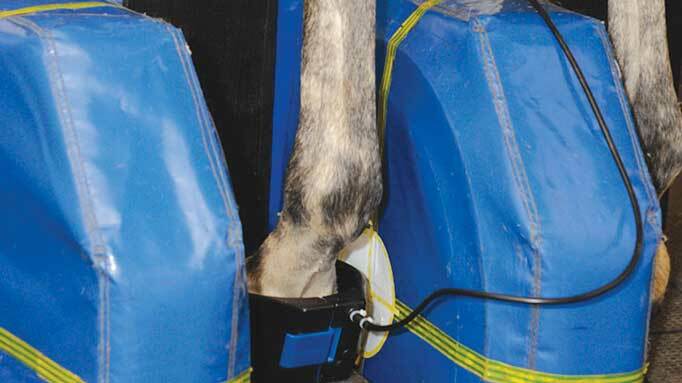 This may involve using nerve blocks to isolate the source of the pain, or other types of imaging such as nuclear scintigraphy, where radioactive substances are administered to the horse and images show injured areas as “hot spots.” These areas are then targets for an MRI to determine the cause with more precision. The next crucial step is reading the images. “There can be several hundred images to go through, and we examine them very carefully,” says McKee, who has completed several courses and continues to do additional training in the interpretation of MRI scans. She also works with board-certified radiologists in cases where she is unsure. Each scan produces an image in shades of black and grey, so expertise is required to identify the various parts of the horse’s anatomy and recognize abnormalities, excess fluid, etc. In many cases, follow-up scans will be needed to see how the injury or affected area of the hoof is healing. McKee explains, “A follow-up scan may help to protect the horse from re-injuring himself. Every horse is a little different and some will not heal as quickly as others. You can give an estimated time frame, but if you put the horse back into work too soon you can end up with another injury and have to start the healing process all over again. 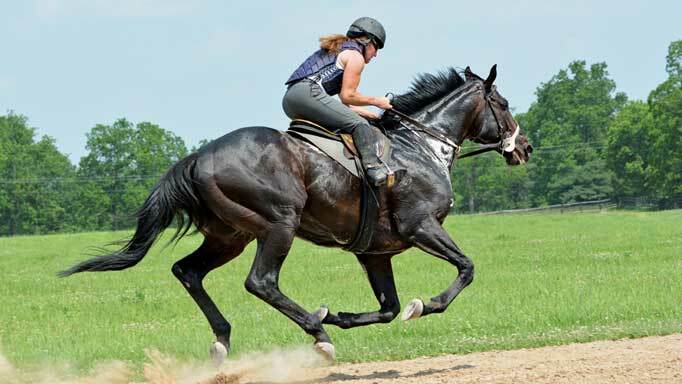 The second scan tells you if the horse is truly ready to resume work.” These follow-up scans are done at a reduced fee and usually take less time, because the technician is able to focus on a particular area. While standing MRIs remain uncommon in Canada (McKee and Pownall see horses from all over Ontario; another standing MRI is in Saskatchewan), some other locations such as the Ontario Veterinary College have MRI machines that require the horse to be placed under a general anaesthetic and lying down during the procedure. This does carry some additional risks because of the anesthetic, but provides the same helpful information. 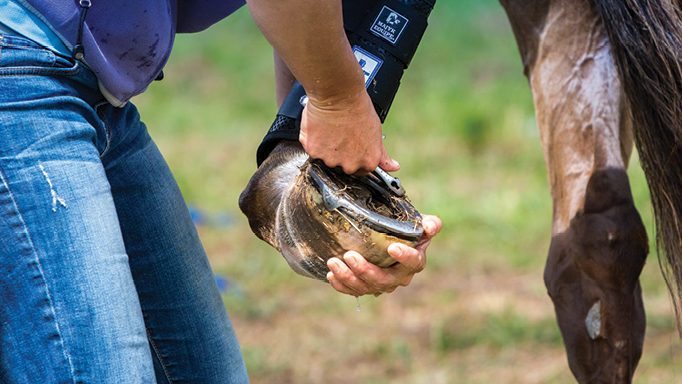 When to create comfort with hoof pads and packing materials. 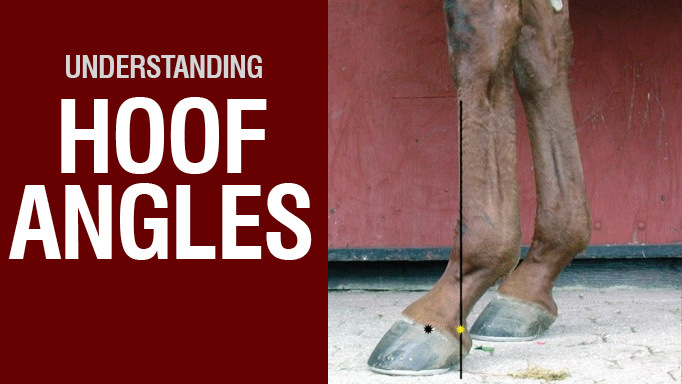 Assessing hoof angles for optimal foot health.